How does the prospect of sitting in silence staring into a stranger's eyes make you feel? Nervous? Uncomfortable? Why? This was precisely the situation I found myself in last weekend when participating in a one-on-one performance by the artist Caroline Smith. In a room overflowing with old sewing machines and posters of Jonny Woo, I spent ten quiet minutes looking at someone I'd never met before. The performance was part of an ongoing project 'I look you in the eye', exploring the feeling of complicity that locking gazes elicits. By taking the act of looking directly into someone's eyes out of an everyday context, Caroline Smith draws attention to its potent and contradictory connotations: Staring is associated with flirting as much as it is with fighting; and, while it's rude to gawp at strangers, an inability to sustain eye contact is supposedly a sign of lying. So was my trepidation justified? Far from it. After an initial few moments of awkwardness it became surprisingly easy, relaxing even. The world beyond seemed to melt away, leaving me in the present moment. Invigorating, inspiring stuff. 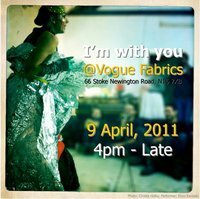 Caroline Smith was performing at the fifth instalment of I'm with you on April 9 at Vogue Fabrics, Dalston. I'm with you is a series of live art events that take place in houses, gardens and other unusual spaces in and around Hackney. Images by Ania Bas.